Do you have a 2-stroke or 4-stroke engine on your snow thrower? — If you are running a 2-stroke engine I’d say you are in the minority of snow blowers especially if it is a new machine. Check the manual and see what type of 2-stoke oil it requires. The default is Saber Professional 100:1 (ATP). 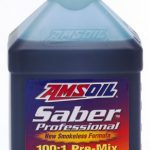 If your manual calls for a TC-W3 oil because of the lower temperatures experienced with winter OPE use the Saber Outboard 100:1 (ATO) which meets that oil specification. What oil are you currently using in your vehicles or other OPE? — It is really convenient if you have a 0W-30 or 5W-30 oil already being used in one of your vehicles you can simply use that in your snow blower. Since the oil should already be on hand you don’t need to purchase a special branded snow blower oil – just use the best oil you put in your vehicles. A problem arises when you don’t have a vehicle that takes a multi-weight SAE 30 oil – you’ll have to look at other options. 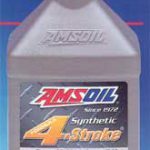 I wouldn’t suggest a 10w-30 or straight SAE30 for winter applications unless it is a full synthetic with a great pour point like Formula 4-Stroke 10W-30/SAE 30 Small Engine Oil (ASE). ** My lawn mower gets 1/2 a quart of ASE when I pack it away for the winter. That is the same time I’m getting the snow blower out of storage so it is an easy choice to use the ASE in the snow thrower too. It has a great pour point of -39°C which leaves plenty of room for Mississauga winters to get cold. ASE has enough ZDDP to protect the engine from excessive wear and also has great rust protection additives which keep an oil film on the internal engine components during long periods of inactivity. How cold do you expect winter to be in your area and where do you store your snow blower? — I’m trying to figure out the lowest cold cranking temperature the snow blower is going to experience on the coldest day of the year. You want to use an oil that has a pour point 20°C lower than the coldest temperature you expect to see in your area. If you expect temperatures below -30°C use a synthetic 0W-30. In Southern Ontario it will probably get down to -20°C but we are protected by the great lakes. Other parts of Ontario may get down to -30 or -40°C – don’t count the wind chill. If the equipment is stored outside and sees the full cold temperatures you’ll need an oil with a pour point lower than the expected coldest day. I don’t run the snow blower when it’s below -30°C outside. Not because I can’t but because I’m drinking coffee in the kitchen thinking about how cold it is outside. 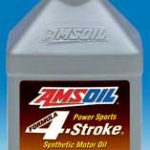 Not everyone has this luxury though and I’d suggest AMSOIL Formula 4-Stroke® 0W-40 Synthetic Motor Oil (AFF) with a -51°C pour point to make starting easy and to protect the engine until it warms up for areas that see really cold temperatures. Do you purchase fuel that doesn’t contain ethanol? — I know this isn’t an oil recommendation but this fuel additive can really save your bacon. In Canada the only fuel I know of without ethanol is Shell premium grade – which could change at any time. Odds are you’re running a fuel with some ethanol content in it – probably 10% or less. Ethanol helps keep the fuel from freezing, but it also binds with water and creates a phase separation which can lead to a lean burn situation at the bottom of the tank. Since my fuel line runs out the bottom of the tank feeding the carburetor the snow blower will try to burn the water/ethanol mix which can damage the piston/cylinder if the oil washes from the walls. Snow blowers are at a higher risk of seeing water enter the fuel/air systems because of the environment they operate in. 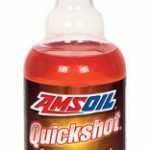 Use AMSOIL Quickshot® to help fight ethanol separation and dirty fuel. It also stabilizes fuel for short periods of time between uses which is import for equipment that may sit for a long time between storms. Previous Previous post: Can I change my oil and forget about it for a year?